NH7RO’s initial estimate of bandwidth (10kHz) appeared too good to be true. 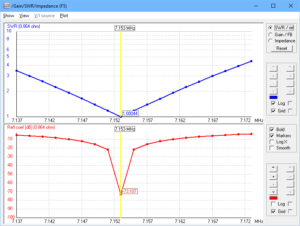 NH7RO later posted a screenshot of a VSWR sweep with his antenna analyser. 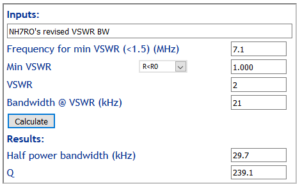 Above is an extract of NH7RO’s pic of the analyser screen which I have annotated with the VSWR=3 bandwidth (29.1kHz). 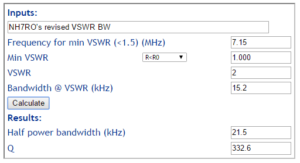 The pic also indicates that minimum VSWR=1.0. 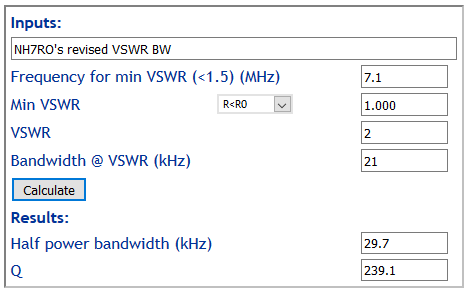 That is equivalent to a half power bandwidth (VSWR=2.62) of 25.2kHz. 10kHz was too good to be true! The calculator depends on an assumption that the current is uniform around the loop. It is most accurate for small loop perimeter, accuracy suffers for perimeter>0.1λ. Loop perimeter is calculated at 0.159λ. The perimeter contributes significant error to estimation of radiation resistance, it will be higher than estimated and that rolls into the efficiency and gain calculation. The loop is mounted very close to natural ground, and that will tend to result in radiation resistance a little higher than free space resistance and that rolls into the efficiency and gain calculation. An NEC model was constructed of an octagonal loop of the same diameter conductor and perimeter as NH7RO’s loop. The bottom of the loop is 1m above average ground. 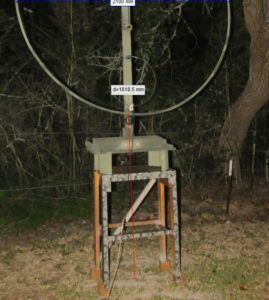 The loop was resonated at the top and the tuning load built out with resistance to obtain the same VSWR response as NH7RO (albeit measured in the primary loop). 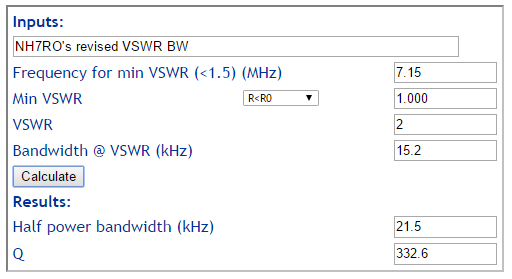 Above, the VSWR=3 bandwidth is 28kHz, approximately equal to that taken from NH7RO’s measurement above. The model was then calculated at the resonant frequency. Radiation efficiency was calculated at 9.4%. 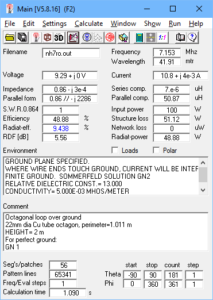 We can deconstruct the feed point R of 0.864Ω into radiation resistance (0.08154Ω), antenna structure loss resistance (0.422Ω), and ground loss resistance (0.3605Ω) (all referred to the primary loop feed point). The model suggests that the loop conductor resistance is only a small part of the loop structure resistance, a common outcome. 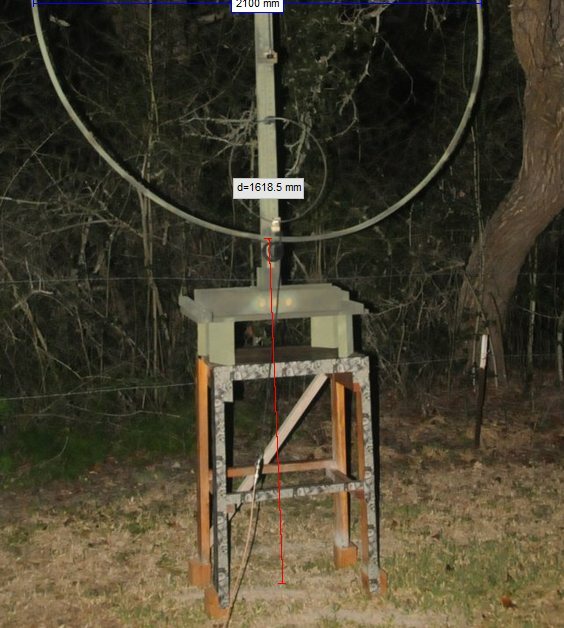 The best way to determine efficiency is to measure ground wave field strength at say 2λ or more from the antenna, and adjusting for estimated ground losses, estimate the efficiency (just as is commonly done for MW broadcast station antennas). Ground wave Field strength measurement is not difficult, quantitative but not difficult (Belrose 1998). Structure efficiency is indicated by the NEC model to be 48.88%, ie 51.1% of the transmitter power will be converted to heat in the antenna structure. The loop will resonate with a tuning reactance approximately equal but opposite to the loop reactance, so around -290Ω. The NEC model indicates current in the capacitor is likely to be around 7A, so the peak voltage across the capacitor at 100W is of the order of 3000V. System losses helps to moderate this voltage. What does QRO mean? It is another meaningless ham metric, if you took it to mean 1500W, then the capacitor voltage would be almost four times that calculated for 100W above. NH7RO’s QRO seems to be 650W, so about 2.5 times the voltage calculated for 100W. As the online thread ‘documenting’ this antenna continues its path, after some minor revision and rework of the structure and feed loop, further measurements were presented. The bottom of the loop appears to be 1m above ground. 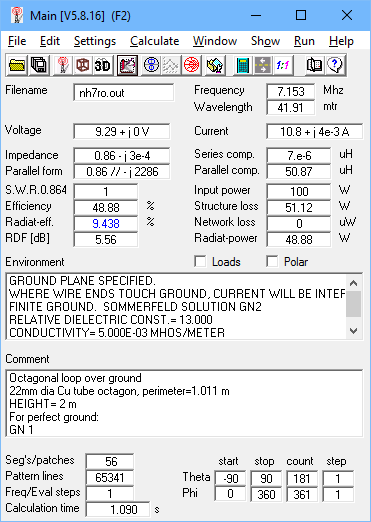 2:1 bandwidth points: 7.121 2:1; 7.129 1:1; 7.142 2.1 so 21 kHz b/w. The latest measurements imply a half power bandwidth (VSWR=2.62) of 30kHz, a little worse than the analyser plot, but given the resolution / uncertainty of the above figures, it might not be significantly different to the more detailed figures scaled from the analyser pic. 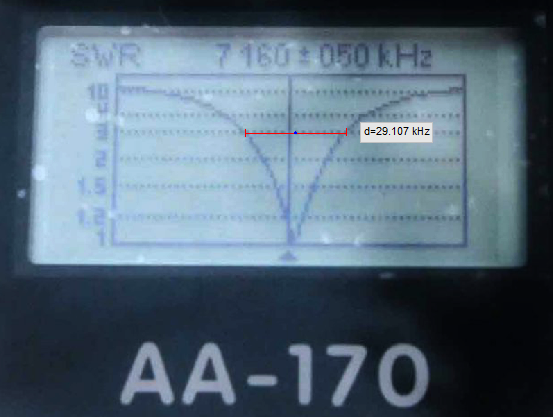 Hams tend not to recognise the value of the VSWR plot of a matched loop, and analysers such as the AA-170 used by NH7RO can save that plot to a computer for presentation in better detail than on the analyser’s own screen. 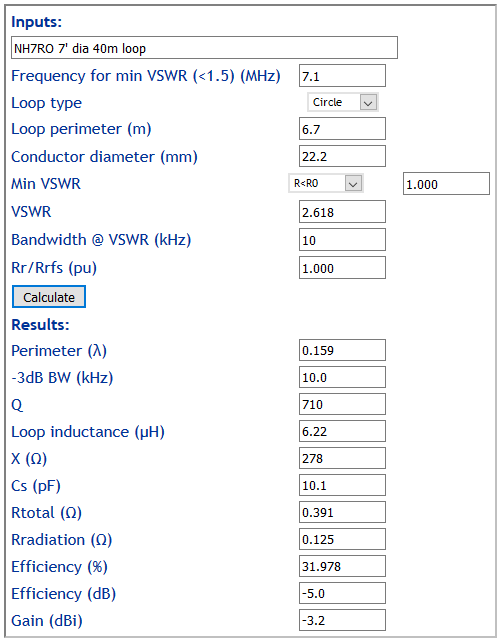 The KI6GD online calculator estimates that I should have 11.7kHz b/w and a Q of 610.5 Qres but I’m not sure what the SWR parameters are in that calculator. It seems like my loop is a bit lower Q than expected but perhaps not far off. There is a simple relationship between Q, frequency of resonance (f0), and half power bandwidth (BW), Q=f0/BW. This is fundamental, it is definition of Q, the meaning of the term so freely bandied about by hams. So, for NH7RO’s 25kHz BW at 7150kHz (derived from the analyser pic above), Q=7150/25=286, less than half that quoted from the calculator. 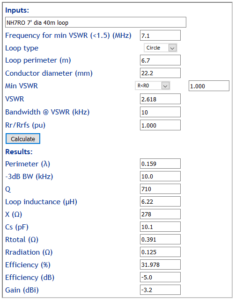 The link cited earlier discusses failings of some STL calculators, and adding to the woes is that NH7RO’s loop perimeter at 0.159λ is too large to permit reasonable accuracy of the Rr estimate in such calculators. Above, calculation of BW from the new figures, a little greater than indicated by the earlier analyser screen but perhaps with greater uncertainty. All else being equal, wider bandwidth implies lower efficiency. As the online thread ‘documenting’ this antenna continues its path, after some minor revision and rework of the structure and feed loop, further measurements were presented. The bottom of the loop now appears to be 1.6m above ground. 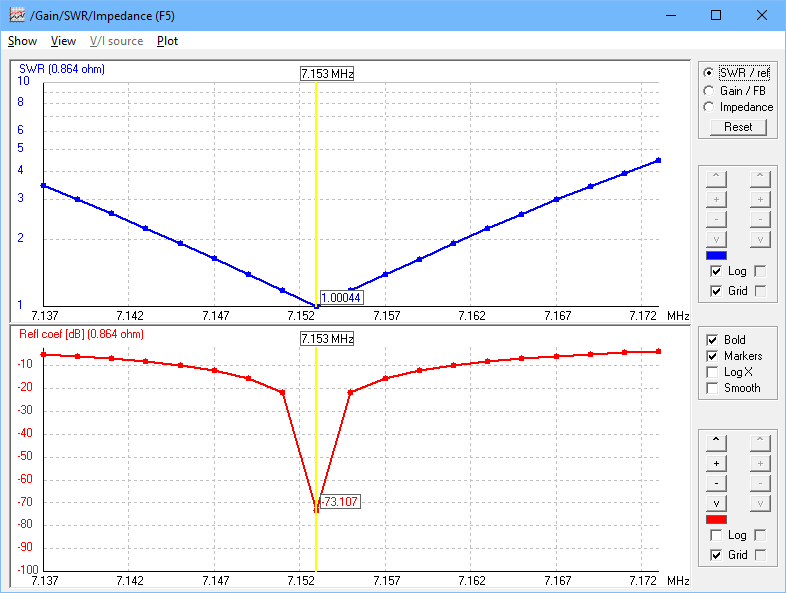 The antenna is perfectly matched at 7.159MHz, we can calculate the half power bandwidth. At 21.5kHz, it is a significant reduction on the previous 29.7kHz resulting presumably from raising the height above ground from 1m to 1.6m. Two parameters that are quite subject to height above ground are radiation resistance and equivalent ground loss resistance. You cannot simply assume that changed bandwidth was entirely due to reduction in loss resistance, and therefore quantify the efficiency improvement. This is where valid field strength measurements are invaluable. All calculated results depend on assumptions and on NH7RO’s measurements, pics etc. 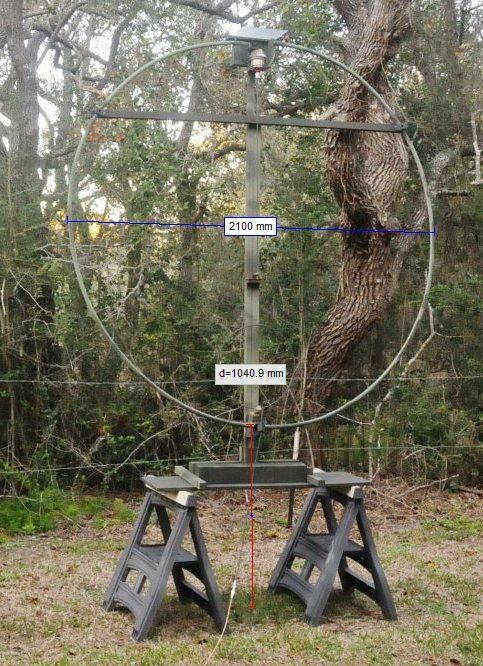 NH7RO’s measurements of an “intermediate sized” transmitting loop on 40m suggest an efficiency around 10% which is quite good, nothing like his original estimate of 66%. Ground wave Field strength measurement permit better evaluation of antenna efficiency… and this is not difficult, quantitative but not difficult (Belrose 1998).